A few months back I wrote about how I switched to DVORAK from QWERTY. Last week my logitech keyboard died and I searched for DVORAK keyboards and could not find anyone selling that online in INDIA. 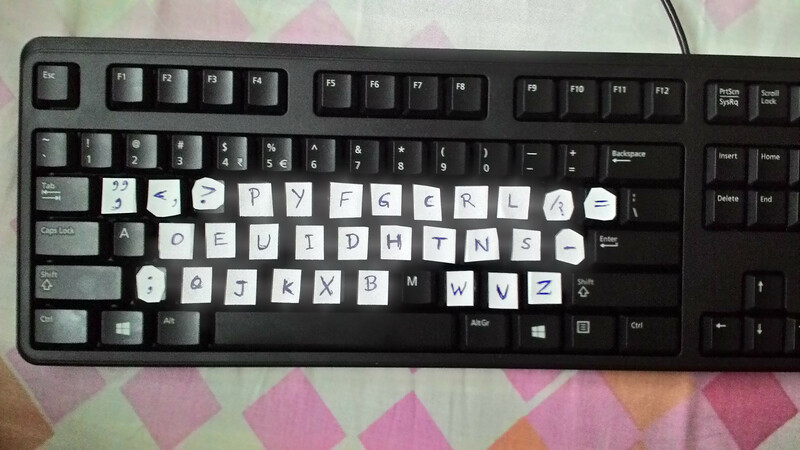 I guess INDIA is QWERTY, therefore I got myself a new DELL KB212-B wired USB2.0 keyboard. As per hardware quality, I will say for 440/- rupees it is damn good. DELL did a great job on manufacturing. I started typing on it and guess what, after using DVORAK for few months QWERTY arrangement felt so idiotic and dumb, not to mention painful, as if QWERTY was designed specially not for typing English words. I was accidentally hitting DVORAK arrangement on QWERTY keyboard. I have used QWERTY since the day I touched computer first time (10 years I guess) but subconciously my hands/fingers were never able to memorize more than half dozen key-positions but few months usage of DVORAK and now I can write 20 or more key-positions of DVORAK arrangement. Heck, I can draw full fledged DVORAK arrangement on paper just from my memory. With practice you can easily memorize any random key arrangement but mind you, I did not practice memorizing DVORAK. What I wean is: DVORAK matches human thought better than QWERTY. I did lot of search on QWERTY vs DVORAK vs XXXXXX and 99% of comparisons were based primarily relative to speed. Let me tell you again, speed, speed, speed, speed, speed, speed, speed, speed, speed, speed, speed and all comparisons were based on one criteria of speed. Everyone (especially the ones who are biased) have ignored the most basic requirement when it comes to typing: “comfort and ease of typing”. I type almost whole day, I do programming and I write this blog and reply to my emails etc. That is me. What about professional clerks and authors and fiction/non-fiction writers who have to type much-much longer hours. Will you sacrifice your body (RSI and CTS) for just a keyboard habit ? QWERTY does not give you more speed than DVORAK, it is the practice which does. All you have to do is change your habit to use DVORAK. Habit before Health or opposite ?